Here is another card that I saw on Pinterest that I decided to CASE. If you look close, you can see all the glimmer on the bird. I did this with blends and then went over with the Wink of Stella. I LOVE the colors used on this gorgeous hummingbird! I LOVE when I can find a card that other than size I don’t have to change anything! Below are the supplies in picture form. Click on any of the pictures to be taken to my OnLine Store. If you choose me as your SU! Demo I will send you a small gift as a thank you! I have always loved frogs. As a Child I had an Aunt who made a HUGE deal everytime I tried showing her a frog in my hand……I would say “Guess what I have” she would not be able to guess so I opened my hands and there was a frog. She would run away and act scared! No matter how many times I would ask her she NEVER could guess what was in my hands! LOL Looking back of COURSE she knew what was in there, she was the BEST Aunt and I have VERY fond memories of her! So, when I saw this So Hoppy Together stamp set by Stampin’ Up! it brought back these fun memories and this was first on my list to get for free! Free?! What?! Yes, for the first three months every year SU! has a Sale a Bration catalog that you can earn FREE stamps! But, time is almost out, you can only get this stamp set while supplies last or the end of March. Go check out Pinterest and see how many ideas you can get using this set! I love how it looks like this frog is almost falling off this bike and his buddy is cheering him on. This is for my Kids card class coming up! Too cute! Sponging the sky and ground make this scene come to life. I added clouds from Up & Away framelits after sponging them with Smoky Slate and then going over the sponged edges with Wink of Stella. This makes the clouds look like they have a silver lining! Below are pictures of the supplies used, click on any of them to be taken straight to my OnLine Store! If you purchase from me, I will send you a small gift to thank you! I changed it up a little by adding layers, a different sentiment and changing the color of the cat. I thought the idea was so stinkin’ cute that I had to make it! Below are pictures of the supplies, click on any of them and you will be taken to my OnLine Store. I would love if you choose me to be your Stampin’ Up! Demonstrator. I love searching Pinterest for a card to make. I found this really pretty one by Susanne Netz and decided to CASE it for a class. I changed it up a bit by framing it with black and matting that onto a piece of Balmy Blue. I ran the Balmy Blue through the Big Shot using the Subtles Embossing Folder. I sponged the edges with Balmy Blue to give it a softer look. Isn’t it Amazing that you can earn this set for FREE!!? Spend $50 on product and get this Stamp set! I LOVE this set! Wouldn’t you love to live in that house? I cut some Window Sheets in the shape of clouds and sponged along the edges of the window sheet to make the clouds. All the supplies are listed in pictures below, click on any of them to be taken to my OnLine Store. I would love if you would choose me to be your SU! Demo! If you purchase from me I will send you a small gift to show my appreciation. I hope you enjoyed this post and that you will visit again! Today I am sharing with you a card that I HAD to make! I saw it on YouTube by Esther-Stampin Star Creations. THIS card was so much fun to make and I LOVE Black and White cards! The ONLY thing I changed up from Esthers’ card is I added the Baker’s Twine on the bottom. I also think my white is smaller than the one she used, I didn’t notice it was smaller until after I cut it! So there it stayed. When you look at this card, it looks like it would difficult. Or time consuming. It’s neither! Sponging is the main effect and that is easy to do! I absolutely fell in love with this card and when that happens I HAVE to make it right away! I was done for the day, put on a video on YouTube and saw this one while I ate dinner. Normally I would plan on making it the next day, but this called to me and now that I have made it……..I LOVE it! Thank you Esther! If you are looking for a Stampin’ Up! Demonstrator, I would love it if you could choose me! I also have a YouTube Channel, and if you check me out and like the style of cards I make, we could make a great team! Below are pictures of the supplies that I used, click on any of them and you will be taken to my OnLine Store! If you purchase from me I will send you a small token of my appreciation! 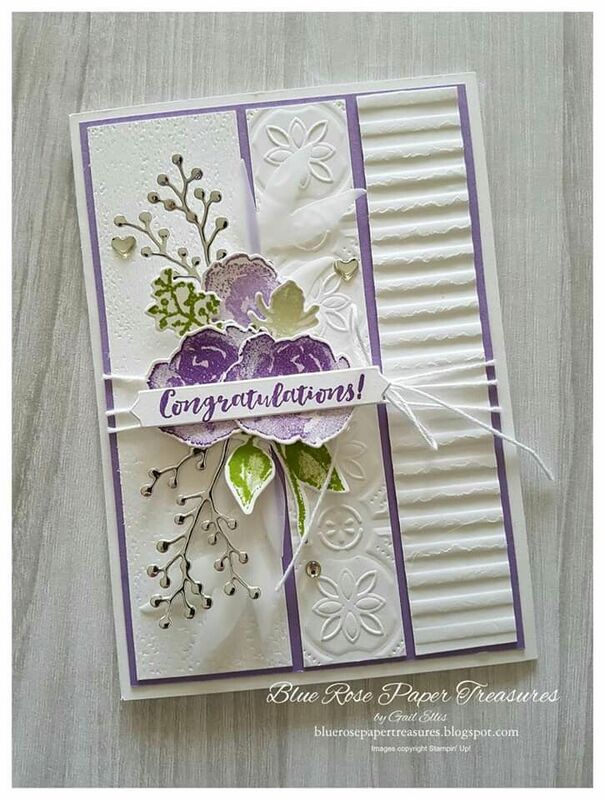 Today I am sharing with you a handmade card that uses the Wonderful Romance Bundle! If you haven’t seen the DSP that has printed Vellum you are missing out!! I bought one pack, saw it, then had to buy another just so I wouldn’t stress if I used it! Can you believe that the floral on top is Vellum!? When you place a piece of White cardstock under it, the whole thing POPS! I also used the new Lace Dynamic Textured impressions Folder. Can I just say this card is one of my favorites I’ve done?! For every class I have, I print out the specifics above so they can take it home and file it away to re-make this card at their leisure. I would love to be your Stampin’ Up! Demonstrator! If you didn’t know, I do videos on YouTube and you can go to my Channel and see if I am a good fit for you! Below are pictures of each of the products I used for this card, click on any of them and you will be taken to my OnLine Store! I would love your business! If you purchase from me, I will send you a small token of my appreciation! Another card from Pinterest! I saw a card by Gail Ellis and decided to CASE (Copy and Share Everything) it. This card was for a class so I made a few changes to make it not tooooo hard! I think it’s very pretty, never thought to combine embossing folders on one card. I hope you like my version as much as I liked hers. Everything needed for this card is pictured below, click on any of the icons and you will be sent to my OnLine Store! All Online purchases get a gift from me!